Starry Safari | What is ML Reading? Last week, ML bragged, “I read an entire Rainbow Magic chapter book today.” I was both impressed and sad. I feared she might start telling me picture books were babyish. Thankfully, even books with the simplest text still appeal to her. She was immediately hooked on the book AH HA! by Jeff Mack. There are only three words in this book Ah, ha, and aaah. Those three words and Mack’s brightly colored illustrations create a robust story. The facial expressions on the animals tell it all. Another great book for both preschool and elementary-aged children. 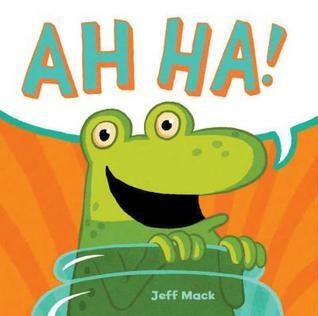 Other books illustrated by Jeff Mack are story time hits – Mr. Duck Means Business by Tammi Sauer, Hurry Hurry by Eve Bunting, Starry Safari by Linda Ashman and Rub-a-Dub Sub by Linda Ashman. 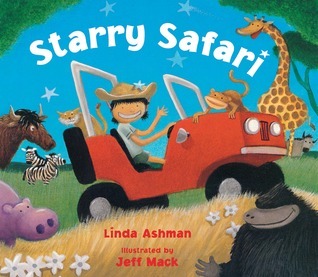 For a few weeks when ML was four, the only book she wanted me to read was Starry Safari. She particularly loved the illustration on the last page of the book.